In every one of our packages we include all of your wedding photographs, in full resolution on disk for you to print as and when you would like, with out restriction. A free no obligation visit from me, prior to anything else, a chance for you to see first hand the Albums, photography and to meet the photographer behind the photos. I wouldn’t expect you to book anyone least of all me with such a meeting, and as such am available bot day and evening to visit you. Book an appointment now via the contact us link above.. I have introduced a shorter coverage if you wish.. I love the complete wedding story, however understand that some do and some do not want photographs taken of the brides preparations and although these are a couple of stylish shots of your hair being dressed and make up being applied, they are more, they capture an essence of the build up, the bridesmaids, family and champagne? And provides an ideal opportunity to get some stunning portrait style photographs of you the bride both alone and with your friends. A full free consultation, to ensure you’re happy with both my style of photography and are completely at ease with me, your wedding photographer for the day, this is with out any obligation and is a chance to make your mind up if I’m right for your wedding photography before you book. Full day Coverage. Coverage of your wedding photography on the day starting from your preparations, your hair and make up( if required) and leaving an hour before your ceremony, giving me the chance to capture your guests arrivals, the groom as he nervously prepares, your arrival and those final touches before your big entrance. A web site of your finished wedding photos, an easy reference point for you and your guests to both view and select your prints for albums and shareing. Free reproduction rights to all of the images on the USB in full resolution allowing you to print off your own wedding photographs at your chosen outlet, or we can print them for you. A free wedding album design and build service to give you an idea of how a finished album would look, and access to albums from every manufacturer to bespoke wedding album where your imagination is the only barrier to what is possible. All our Wedding photography packages contain.. Working with you in advance to make sure these formal groups are arranged sensitively, your arrival at the reception venue is documented, the speeches recorded and discrete photographic coverage continues in the the evening, not to forget the cake cutting and ending on a huge high of the first dance, and the second..
A web site of all proofs, an easy reference point for you and your guests to both view and select your prints. As always including all of our promised cover (As Above) USB and Proof book, your choice of photographs from your wedding will be handed to our in house album designer, who will assemble a first draft of your wedding album before sending to you for your approval. You would be free to make as many changes as you wish without charge, be it layout, colour or the photos you have chosen, and only when you are completely happy with the layout of your chosen photographs do we send this to print. 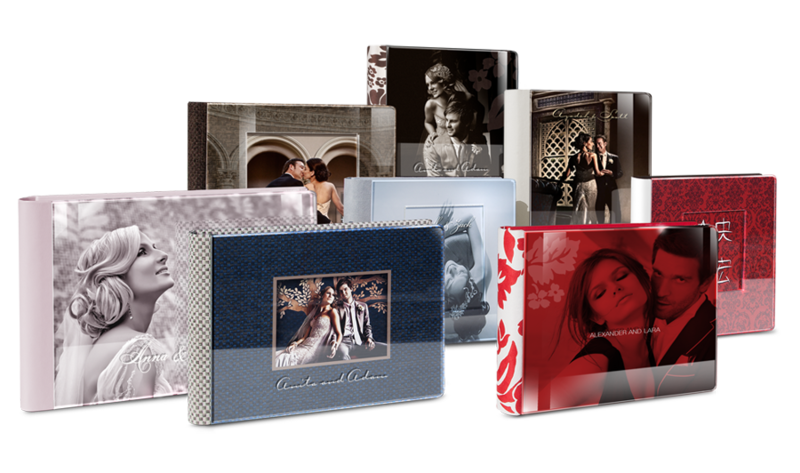 All our Graphi studio albums are hand bound and made in Italy, And the choices of cover and style are almost endless, I will, so its clearer to you, the true quality of these albums and the difference between me and others, bring a sample of these albums when we meet for a chat .